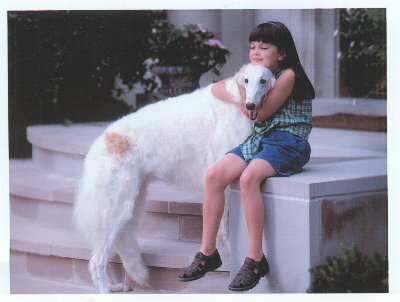 I bought my first borzoi as a pet in 1973, and enjoyed her companionship for 12 1/2 years. She was my best friend. Since then, we've been active in showing, coursing, and, at times, obedience. As time has passed our family of Borzoi (and humans) has grown! We sincerely believe that temperament is the most important consideration when breeding. We want our dogs to be not only beautiful to look at, but loving family companions as well. We screen our dogs for hereditary defects prior to breeding and try to breed healthy borzoi. Each dog is sold with a written contract and guarantee. All our borzoi are micro-chiped and registered to aid in it's recovery should it ever become lost or stolen. If you have any questions or need any help with your puppy or the breed, we are always there to ask, you need not be shy. To prevent a borzoi we have bred from ending up in a Human Society, Dog Pound, or any type of rescue situation, we will always take back any dog we sell, reguardless of age, no questions asked. We will also aid any other borzoi in need reguardless of who may of bred it if we are able.